Product #20686 | SKU 094300-0001-110 | 0.0 (no ratings yet) Thanks for your rating! 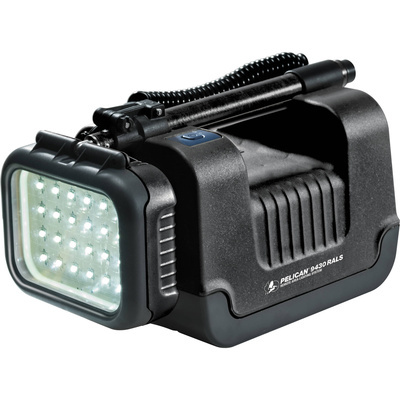 This Pelican 9430 Remote Area Lighting System Head Black (R.A.L.S.) is a stand-alone head, mast and battery system that is an ideal portable light for fire, rescue, emergency, and military applications. The 9430 consists of a power unit with a 125° LED array on an extendable (up to 82 cm) mast. Operation and setup is fast and very intuitive. The head and mast fold neatly into the battery base, minimising space concerns. This improved version boasts 3,000 lumens of output on the high setting and gets 15 hours of run time on a fully charged battery (low setting).